The line up for the films in competition at Cannes was announced today. I don’t think I’ll make it to Cannes this year – I was lucky enough to have my two previous trips paid for, the first after winning a pitch competition at the Screen Academy and then last year’s trip paid by CYFLE as part of my film traineeship. I never took too much notice of the films in competition in honesty – I was more interested in checking out the market, the pavilions and the various events that go on. Anyway, this year’s competition sees entries from respected Europeans including Pedro and Ken, and also the latest from Quentin – let’s hope it’s a return to form after the miserable Death Proof, which had only one scene that I’d consider vintage Tarantino. The full list of competition films is out there if you google. Next week, I’ll be at Mwnci in Cardiff for the online edit and grade of my short film ’17’, a revenge tale set in a tough South Wales neighbourhood. Time has flown – we actually shot the film in September 2007, but the week following the shoot was my first week as a CYFLE trainee, and I’ve worked solidly since, so getting the time to finish the film has been difficult. Jamie (the writer/director) moved to London soon after the offline edit (he’s currently working on this), and we didn’t actually have the money raised to finish the film until August 2008, thanks to a bursary from the Screen Academy Wales. Kate @ Mwnci has shown us a great amount of support and I’m truly grateful. We did have time to complete the sound mix late last year, thanks to a great deal from Curig Huws at Streetlevel Studios. I can’t recommend Curig’s services for your audio post-production highly enough, he’s more than happy to advise you on what you might need and how to make your budget work for you. If you’ve got a short in the works, give him a ring. So, this time next week, I should have the short completed in glorious HD. Then we hit the festivals – we’re too late for Cannes now, but there’s lots more coming up. I’ve applied to take part in the Engage programme for 2009, it’s like an EAVE for recent graduates, which brings together writers, directors and producers from all over Europe to learn through masterclasses and case studies. I wanted to apply last year, but wasn’t sure if I could get time off from the Cyfle scheme to go if I was selected, plus I didn’t know if I could afford to go either. Luckily, the SSAW are offering bursaries to two students/graduates who might be selected this year, so if I do get selected, some of the costs will be covered. It’s already heavily subsidised, but as it takes place in Dublin, Edinburgh, Tallinn and Helsinki then the travel costs will mount up, in addition to the course fees. Vivien took part in the Engage course last year, as did Vesa Kuosmanen, who was 1st AD on Avoiding Christian Bale. They both got a lot out of the programme, and if I do get selected, then I hope to meet a lot of people and develop a project I have been working on. The project itself is a drama/thriller inspired by some of the places I visited when on tour with Captain Everything! in 2004, but it’s pretty much just a concept and there’s no writer on board as yet. I had to submit the project proposal as well as the usual info about myself and a ‘personal motivation letter’. I toyed with adding the sentence “I’d particularly like to go to Tallinn because the women in Estonia are amongst the finest looking in the world”, but these letters aren’t really the place for glib, semi-chauvinistic statements, no matter how truthful they may be. The sort of support and guidance that this scheme offers is pretty much invaluable, so fingers crossed I’ll get in. I’ve seen the scheme advertised in Screen International this year, and so I would guess the competition will be fierce, but you never know, they might see the potential in my proposal and my application will get through. The deadline has passed, so I’d imagine their sifting through the piles of paper right now. As Jesus’ birthday gets closer, we’re into the last week of principal photography of Avoiding Christian Bale. Our production designers Ben and Hollie have been carefully collecting and storing props and art from the shoot in case we need to re-shoot anything later on. Hopefully we won’t. The time has gone by pretty quickly, as has the whole of 2008 for me. This time last year, I was finishing work on a Welsh language Christmas film called Rhestr Nadolig Wil, as a trainee on the Cyfle film scheme. It was my first placement on the scheme and it seems like a heck of a long time ago now. I’ve learned a lot about the industry since then, not just about how to do your job, but also about the politics that envelop it all. The old adage of ‘it’s not what you know…’ is what everyone gets told when you start out, and there’s an element of truth to it. If people don’t know you, how can they give you a job? Or fund your film? Or recommend you to someone else who might do either for you? Networking is vital, but nothing is more vital than working hard when you do get yourself into the position where you might impress someone. People will notice if you work hard, turn up on time and treat other people with respect. They’ll also notice if you don’t do those things, and you don’t want anyone to remember you because of that. You can make up for a lack of knowledge with commitment and motivation. When I was training, there were times when I felt like I had nothing to do, so I would try and find things to get on with, or (if I thought it appropriate) ask other people about their job and what they were doing. I learned a lot that way. I also learned a lot by listening to all the other phone calls that came into the production offices I was in. Sometimes I was expected to know what other people had said in conversations I wasn’t involved in, so you have permission to eavesdrop. You’ll sometimes make mistakes. Try and learn from them, and learn from other people’s mistakes while you’re at it. That will save you a lot of time in the long run. Cyfle have launched a new film scheme, which started this month. Well done to all the new entrants to the industry who’ve been selected for it, and good luck for the future. 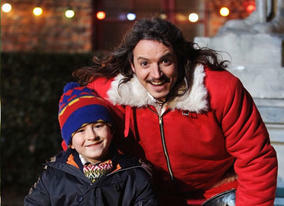 Tonight, I’ll be in Cineworld for the screening of Rhestr Nadolig Wil before it airs on S4C. The latest in Boom Films’ Micro Movies series, it was produced by Jon Williams, and directed by Daf Wyn, who has actually written some Batman comics. I should put some sort of Christian Bale/Dark Knight type gag here to tie it all up, but sadly nothing springs to mind.